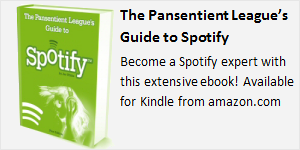 Pansentient League » Elektronische Musik aus Deutschland auf Spotify! Elektronische Musik aus Deutschland auf Spotify! German electronic music shaped my music tastes more than any other. As a young boy in Scotland in the early 1980s, hearing Kraftwerk for the first time had such a huge impact on me that I immediately archived all my Beatles and ABBA records and sought out anything I could find by Kraftwerk, Nena, Alphaville and the rest of the Neue Deutsche Welle. I even signed up to learn German at school for the sole reason of being able to understand the lyrics of my new-found musical homeland. 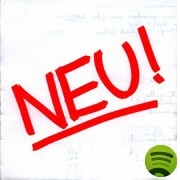 Perhaps not the most electronic of the original Krautrockers, but Neu! set the beat for electronic pop music that was to follow and I always found them the most accessible compared with the likes of Can, Faust, Popol Vuh and Cluster. The Neue Deutsche Welle and Krautrock has seen quite resurgence of late: see my post New Krautrock on Spotify for more on the new generation of bands influenced by Neu! Truly one of the greatest bands ever, these men/machines can be considered as single-handedly inventing electronic pop music, dance music, house, trance, techno, minimal, even rap and hip-hop! 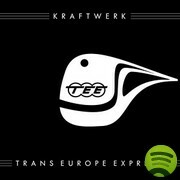 I’ve chosen 1977’s Trans-Europe Express as this was the album that gave me that “O – M – G…!” moment when I first heard it all those years ago. While Britain looked back to their ancient past with royal celebrations, in Europe the future had already started for anyone who had a ticket. See Kraftwerk Live in 3D at Die Alte Kongresshalle for Nix Lowrey’s account of Kraftwerk’s recent performance in Munich. Outside Germany, Nena is probably thought of as just a one-hit wonder. But she’s had a long and successful career in her homeland, with dozens of albums, retrospectives and even an autobiography under her armpits. A school friend came back from Germany one summer and gave me a cassette of ? 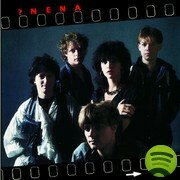 (Fragezeichen) – Nena’s 1984 album with not a red balloon in sight. I listened to that tape to death on my then-new Sony Walkman… look out for Der Bus is’ schon weg – the World’s shortest synthpop song! My love of that strange synthpop/industrial hybrid known as Electronic Body Music (EBM) harks back to these guys from Düsseldorf. Alles ist Gut from 1981 opened my eyes to all sorts of musical possibilities when I unearthed it in a 2nd-hand record shop. It features DAFs most famous song: Der Mussolini. 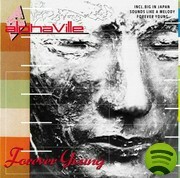 Alphaville’s single Forever Young was a huge synthpop hit in the mid 1980s. The album of the same name was a massive favorite of mine back in the day, and it still sounds incredible today. Recent release Catching Rays on Giant is very good too and saw them return to their pure synthpop roots. It took ages to make it to Spotify but I’m glad to say it’s on there now! 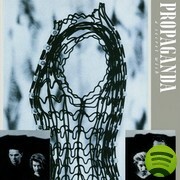 Frankie Goes To Hollywood may have sold bags more records, but for me Propaganda were always the jewel in ZTT’s crown. Their debut album A Secret Wish remains one of my Top 10 albums of all time, I think I must have bought it half a dozen times on various formats and reissues. There’s just something transcendental in here, for years I was convinced of all sorts of hidden meanings. You might have recently heard Propaganda singer Claudia Brücken singing in a nightclub in videogame L.A. Noire, but for more on what she’s been doing recently check out this fascinating interview with Claudia Brücken on The Quietus. The 1990s were pretty dire for synthpop fans, but two German bands were holding the light for us and putting out some great records. And One (see below) are still going strong, but the other was Wolfsheim who sadly split some years ago. 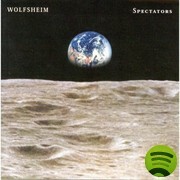 Spectators is my favorite album of theirs: check out tracks like Touch for an example of the quality of their music. Fusing a hybrid of EBM and Depeche Mode-flavored synthpop, And One have an extensive back catalog and seem to get better and better with each release. I named their album Tanzomat as one of my Top 20 Electronic Albums of 2011, but I think my favorite And One album is Bodypop. 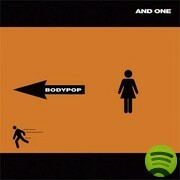 Bodypop managed to blend perfectly the darker and lighter sides of electropop and I played it to death when it came out. Unfortunately missing from Spotify is the Frontfeuer EP, included with some releases of Bodypop and featuring another five great examples of their Kind of Deutsch. It took me a long time to get into De/Vision. I’d heard them on and off throughout the nineties and noughties, but it wasn’t until Popgefahr in 2010 that I thought they’d finally backed up their synthpop sound with strong song-writing. They might come across initially as yet another Depeche Mode clone, but De/Vision do have a distinct sound and they’ve successfully carved a niche for themselves with a dedicated and fairly large fanbase. 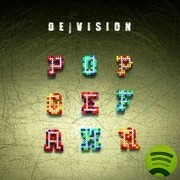 De/Vision followed up Popgefahr with a remix album, which includes a mix by fellow German synthpop act T.O.Y. 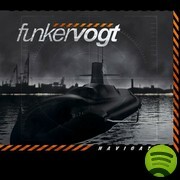 Firing out a blend of electro-industrial, futurepop and “aggrotech” since the mid 1990s, Hamelin’s Funker Vogt have been my favorite modern German band since I heard remix album T back in 2000. The vocals are harsh and distorted and the songs are predominately about war, but listen to the lyrics and you’ll soon realize that this is anything but glorification: the tragedy of armed conflict is at the forefront of Funker Vogt’s music. Oh, and if the Neue Deutsche Härte is your bag, note that there’s still Keine Rammstein Aus Spotify. 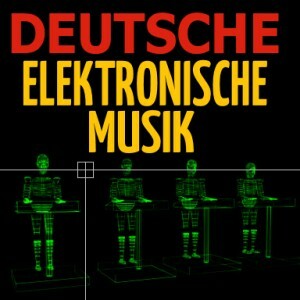 Elektronische Musik aus Deutschland: The Spotify Playlist! To celebrate Spotify’s arrival in Germany, I’ve created a special Spotify playlist called Deutsche Elektronische Musik. It features all the above bands, as well tracks from Absurd Minds, Blutengel, Camouflage, Chapeau Claque, Deine Lakaien, Der Plan, Die Krupps, Diorama, Frozen Plasma, Harmonia, Klirrfaktor, Melotron, Polarkreis 18, Schiller, Tangerine Dream, Welle: Erdball and more! 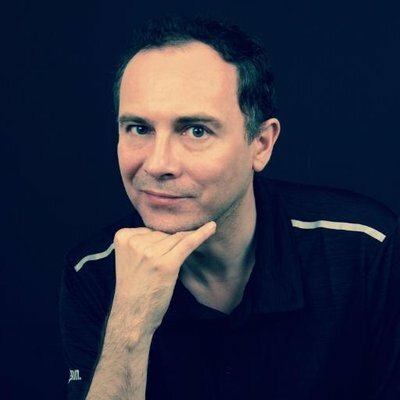 The playlist is loosley chronological, with an overriding cluster of sub-genres taking in the birth of German electronic music, old-school and modern synthpop, futurepop, EBM, and electro-industrial. The playlist ends with a section dedicated to minimal synthpop, ambient and Kosmische Musik. For track suggestions, special thanks to Barry Page, Christine Hall, Philipp Anz, Sebastian Hess, The Crippled Claw, and especially mein besonderer freund Deutsch: Lola Kxx!